The photo above is real, and in the last several days it has drawn lots of attention. 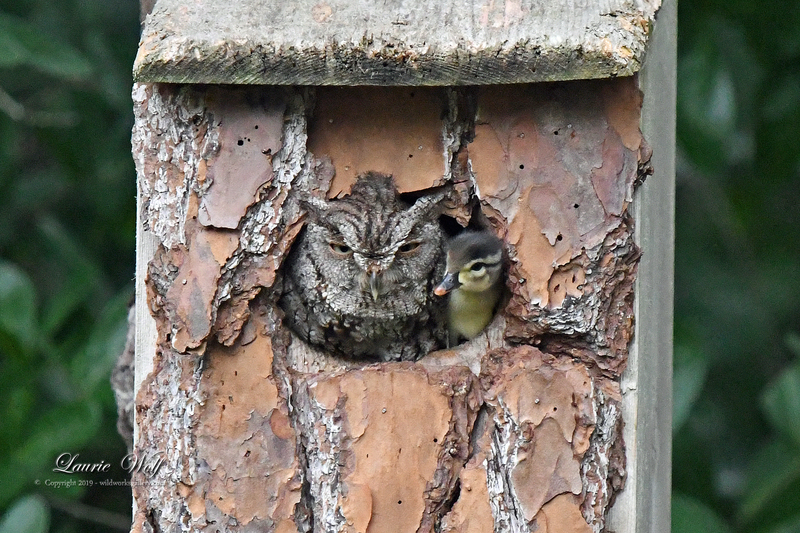 As you can see, an Eastern Screech-Owl sits next to a young Wood Duck in the entrance to a nest box. Laurie Wolf, an artist and photographer, noticed the scene last Tuesday in her backyard in Jupiter Farms, Florida, in the southeastern part of the state. About a month later, in early April, Wolf saw a pair of adult Wood Ducks in an oak tree near the nest box. “They’d be sitting there in the mornings and sometimes in the afternoons,” she says. Wolf consulted a raptor expert, who suggested that she remove the duckling from the box before nightfall because the owl could kill it. Thanks to Wolf’s photos, the amazing story has gone viral on social media and was featured on local NBC station WPTV on Friday. 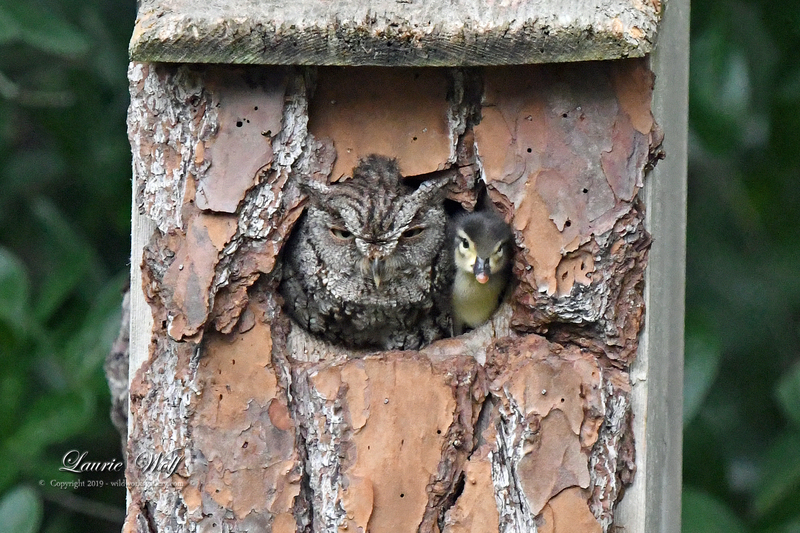 This is not, however, the first time people have observed a screech-owl raising young Wood Ducks. 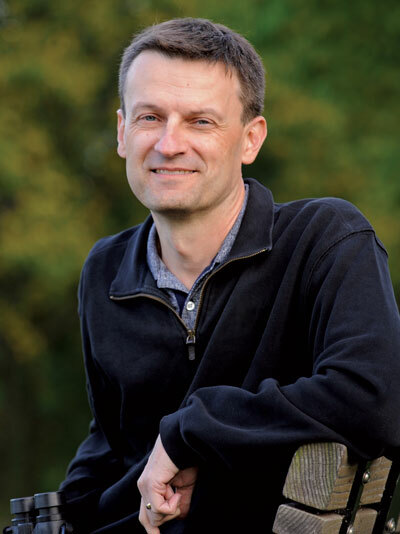 In 2005, ornithologist Christian Artuso (now the Manitoba Program Director for Bird Studies Canada), placed a small video camera in an Eastern Screech-Owl nest box in suburban Winnipeg. An owl laid five eggs in the box, but a few weeks later, the eggs started to disappear and new, larger eggs appeared in the box. Artuso wrote in the Wilson Journal of Ornithology that a female Wood Duck removed the owl’s eggs and laid three of her own. The screech-owl drove the hen duck away but then incubated the new eggs for about a month, until they hatched. The owl preened the ducklings, brooded them, and attempted to feed them. In less than 36 hours, the three ducklings left the box, but Artuso didn’t know if they survived. 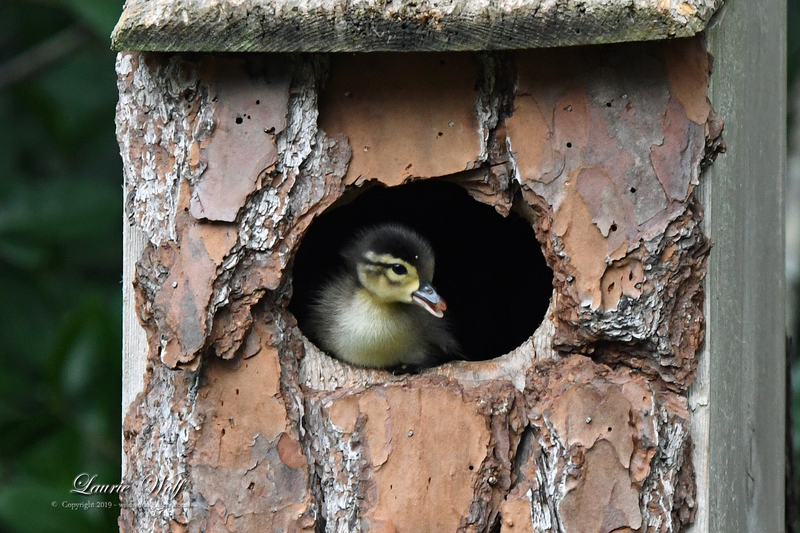 The author also noted a few other known instances of raptorial birds incubating waterfowl eggs, especially in nest boxes. As for the owl in Wolf’s yard, she says it’s still in the box.